The Honey Monster® septage receiving station and FOG receiving sytem quickly screens and processes septage, grease, FOG or sludge from haul trucks. This automated septage acceptance plant provides for cleaner handling of septage truck waste by reducing and separating unwanted solids such as rocks, rags, clothing, plastics and other troublesome trash. The unique combination of grinding, solids removal, washing and dewatering allows a typical septage truck to unload in 5 to 15 minutes. The septage receiving station is completely enclosed to ensure safety, vector control and containment of foul odors. The automated Honey Monster septage receiving station makes the challenges of managing septage waste easy for both the wastewater plant operator and the hauler. The hauler just connects their cam lock hose septage acceptance stations and starts the flow. Septage waste will pass by the SRS3000 Rock Trap before the Muffin Monster grinder shreds the rags, clothes, trash and debris commonly found in septage waste. Ultrasonic level sensors work with the system’s PLC to modulate the plug valve and regulate the flow into the screening area. An auger screw and perforated screening trough with ¼” (6 mm) circular openings screens out unwanted debris to protect downstream equipment and the treatment plant. Trash is washed, fully compacted and dewatered for disposal with JWC’s unique double helix compaction zone. The Honey Monster is designed to also be a Fats, Oils & Grease or FOG Receiving station. For municipal wastewater utilities FOG is certainly something to keep out of sewage collections systems so giving local grease haulers an easy and efficient FOG Receiving system can pay dividends. FOG is also a valuable resource for promoting biogas production in anaerobic digesters but it comes with its challenges. The Honey Monster FOG receiving station is ready with the Heavy Object Trap (HOT) to stop rocks, bolts, cutlery and other debris commonly found in collected FOG. Additionally the FOG receiving system can also include a Muffin Monster grinder to break up grease, rags, and other solids that can stop a system. 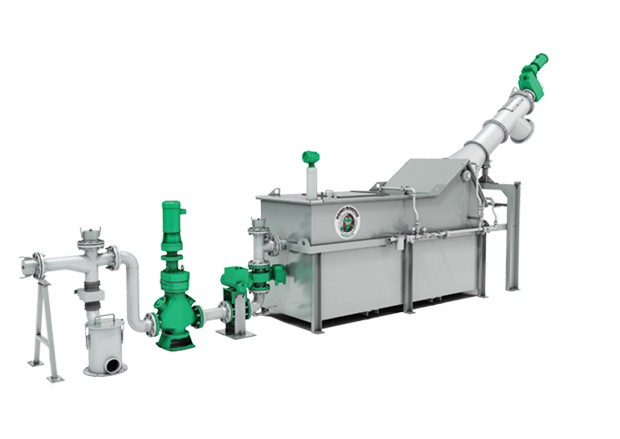 The SRS-XE Honey Monster septage receiving station and FOG receiving plant both utilizes an in-line Muffin Monster® grinder to shred down difficult solids for processing and separation. The Muffin Monster dual shafted grinder has two rows of hardened steel cutters that rotate at slow speed and with incredibly high-torque. These will grind down large solids as well as rags into smaller particles that can then pass into the auger screening area for removal and disposal. The Honey Monster is also available with the optional Monster Track system. This option controls hauler access to the septage disposal systems and will provide data for accurate billing. It provide unique identification of the hauler and tracks the quantity of FOG of septage waste discharged. The Monster Track system can also monitor system levels and can alarm for unexpected pH levels in dumped waste.